On August 14, 1980, 43-year old Police Officer Harry R. Ryman was gunned down while in the process of stopping 3 men from stealing an automobile. Harry served both his Country and his City. He served 8 years in the U.S. Navy, and was a NYC Police Officer for 17 years. He received 17 medals throughout his career and was a member of the 60 Precinct Anti-Crime division at the time of his death. He left behind a wife and 5 children. Harry’s strong love of family and community are the traits for which he is best remembered. He believed in education and continued his own studies at John Jay College. 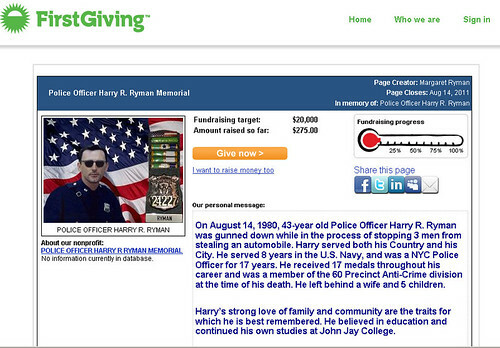 The family of Police Officer Ryman has created a scholarship in his memory. This scholarship is for Police Officers and their dependents from the NYPD who will be attending an accredited university or college. The scholarship is funded by personal and private donations and various fund raising campaigns, which include the raffle of contributions donated from the generosity of individuals and local businesses. The scholarships will be given out once a year on or about August 14.